MAYBE, THE ‘DIM.’S DO NOT CONSIDER, THE SUPREME COURT, AS A ‘PART’ OF A BRANCH OF OUR GOVERNMENT! GEE! I KNOW-OOH, OOH! THEY ARE ‘JUST THERE’, TO ‘LOOK GOOD IN BLACK ROBES! And they can die on the job and not be replaced until Democrats gain control. I don’t like her but she isn’t wrong. The Senate and House of Representative make up the Congress! No moron YOU are wrong as well. Diana, there are three branches of government: 1. Legislative Branch which includes both houses of Congress; who make the laws; 2. the Judicial Branch which is what it says – judiciary/courts which interpret the law according to our Constitution; 3 the Executive Branch which is the Presidents of the United States of America. She is wrong. Articlryis correct. Read the Constitution. There are 3 branches…legislative or Congress and then executive or President, VP and cabinet and then judicial or Supreme Court and other federal courts (federal district and federal circuit courts). Mj – – – basically you are correct, but a couple of things need correction. EXECUTIVE – POTUS and VPOTUS. The cabinet consists of various “secretaries” who are “heads” of various “departments” of government. They are “hired” or appointed by POTUS and confirmed by congress. Their purpose is to advise POTUS. DEPT OF JUSTICE (DOJ) is one cabinet member, DOJ is incharge of ALL law enforcement including FBI, lower courts, etc. VPOTUS is assistant to POTUS. He/She serves as “President” of the congress and assumes control if anything happens to POTUS. EXAMPLE – – – LBJ became POTUS when JFK was killed. Supreme Court of the United States (SCOTUS) basically has ONE responsibility. That is to rule what does or does not adhere to our Constitution. That includes appointments of “lower courts” judges and rulings. SCOTUS cannot just take up an issue and make a ruling. Way SCOTUS works – – – a law or issue is filed as a lawsuit. The opposing sides (for or against – defendant or plaintiff – pursue a ruling thru various lower courts. Either side – defendant or plaintiff – can challenge any ruling made in a lower court. The issue then proceeds thru the next higher courts until it gets to SCOTUS. SCOTUS, as the ultimate legal authoritative, then rules on the Constitutionality of the issue. OK, Diana. See if you can understand this. Congress is made up of TWO PARTS – – the Senate Sn) and House of Representatives (HOR). The Sn & HOR make up laws and rules and is the Legislative. The Executive is made up of the POTUS who is advised by his table of Secretaries (defense, education, justice, etc). The Judicial is made of of NINE Judges (appointed by POTUS and confirmed by the TWO “houses” of Congress). The justices (judges) are supposed to be politically neutral, but the reality is they “LEAN” toward liberal or conservative according to president who appointed them. 1. Legislative – – writes laws including spending, taxation etc. Confirms presidential appointments. 2. Judicial – – SCOTUS – rules on Constitutional issues (do the laws etc written by Congress adhere to or violate the Constitution. 3. Executive – – Signs laws, rules, etc written by congress and confirmed as Constitutional by the judicial into law. OR deletes or eliminates them by signing his VETO OR refuses to sign or VETO and allows them to become law AFTER a specified period of time. A VETO can be overturned by action of a specified percentage of member of Congress. THERE YOU HAVE IT – – THREE BRANCHES OF GOVERNMENT AND BASIC RESPONSIBILITIES OF EACH. She definitely is wrong! The three branches of government are executive, legislative, and judicial. Diana, She is totally wrong. There are 3, count ’em, 3 BRANCHES of government, Executive (The President), Legislative (Senate and House of Representatives)(also known as the Congress) and The Judicial (Supreme Court). Dumbocrats can’t count to three. Warren must have graduated from the same school as Cortez. Both being in congress and still are clueless about the organization of our government. They are not only clueless but seem to be proud of it. 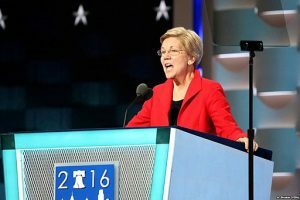 PERHAPS WARREN, IS MISTAKEN, BECAUSE SHE, SEEMS TO ‘MISTAKE’, MANY THINGS, EXCEPT FOR THE FACT OF ‘HER INDIAN HERITAGE’-OOPS! SCREWED ‘THAT ONE, AS WELL! OH YEA! SHE, WILL ‘SURELY’, BE A ‘VIABLE CANDIDATE, FOR PRESIDENT! YEA, FOR US! A.O.C. thinks that ICE is one of the three branches. Is this typical of a person of color professor at Harvard? Poor Lyawathia, just can’t catch a break form the “intense” media scrutiny. BUT, REMEMBER, NOW-EVEN, 1/640TH, ‘PERSON OF COLOR’-HAS, THE ‘RIGHT’, TO SEEK THE PRESIDENCY-OOPS!-UNLESS ‘SHE’, IS PROVEN, TO HAVE ‘PURPOSELY LIED, BY STATING THAT ‘SHE’, WAS A ‘MINORITY’, IN ORDER TO GET A ‘FREE EDUCATION’! THAT LIE, MAY HAVE ‘SAVED HER,’ THOUSANDS OF $, IN TUITION-BUT IT MIGHT NOT ‘WORK SO WELL’, IN A PRIMARY CAMPAIGN! OOPS! Being a Native American (12.5%, 4th generation, documented), the government only recognizes someone that is 10% proven documented. This does not address a DNA or whatever background check. So legally, she is not a legal Native American. I couldn’t even get promotions in the government based on the documentation I had, and letters from my parents who knew first hand my blackfoot history. My great-great grandmother was 100%, I even have a portrait of her, and there’s a book written on our history that dates back 300 years in America, dutch Amish in PA. Quite interesting . Our homestead was attacked by indians and some were “borrowed” and that’s where my native amereican ancestry comes from. The other requirement is that you are suppose to participate in tribal functions which I don’t. You would think she would at least know, you need at least 3 equal branches to pitch a teepee. I think that before a person could run for any office, Representative, Senator, Supreme Court, and President should know the Constitution and apply it as the Framers intended for it to be applied, or they could not be able to run for the office they wanted. The truth is the branches have separate powers and duties, the branches don’t have to be equal, and they aren’t. Trump is chief executive and commander in chief, and that can’t be overridden by some theory of equalness in congress. These sociopath are putting on fantastical airs with their grandiose theories where they imagine they have more legal power than they would ever be allowed. CTLOves whoever – – – you are confusing POWER versus RESPONSIBILITY. There are THREE EQUAL branches of government. They are NOT equal in size. They ARE equal in resposibilities. Legislative in in charge of making laws. Judicial is responsible for ruling on Constitutionality of laws. Executive is responsible for all government operations. Each BRANCH has is own power and responsibilities. Elizebeth Warren is one that belongs in a Koo Koo Hospital and not in the White House. And this is a surprise? Why? Sen. Warren must have checked with Alexandria Occasio-Cortez before she made that unbelievable gaffe on CNN. Now would be a good time for her to withdraw and save a boatload of money, time and effort as she has NO chance of being the DNC’s candidate, much less winning the Oval Office!